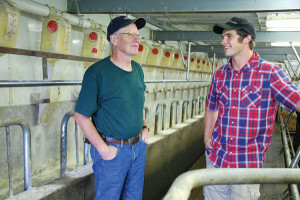 John Richmond II enjoys milking in Chuck Flodquist’s retrofit parlor. In the early years of the Dairy Grazing Apprenticeship (DGA), Joe Tomandl III would field calls from farmers across the country asking if they could hire someone through the program. Unless they farmed in Wisconsin, the answer was “no.” DGA was not approved to operate elsewhere, and it did not have the structure in place to effectively manage the program beyond its Wisconsin base. That has changed, as last year the U.S. Department of Labor accredited the two-year apprenticeship program to operate nationally. Over the past year or so DGA, now an independent non-profit organization, has launched its training program in five other states — Maine, Minnesota, Missouri, New York, and Pennsylvania — and Tomandl says it’s prepared to further expand if local funding and staff support are available. 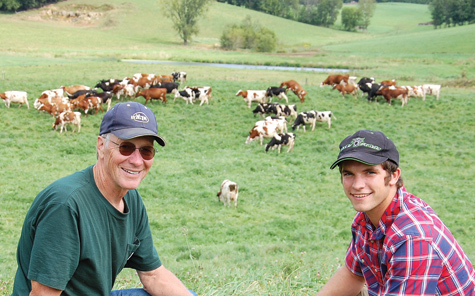 “The apprenticeship is now a truly national program, but we do have to be careful that we don’t outrun our ability to operate effectively,” explains Tomandl, DGA’s executive director and a grazier who has apprentices on his two dairies in northcentral Wisconsin. DGA began as a training initiative in 2012 with the help of a grant from the USDA’s Beginning Farmer and Rancher Development Program. The effort to prepare new farmers grew out of concerns that dairy farmers were retiring without anyone available to continue operating their farms. The idea to develop a formal apprenticeship came from discussions within Wisconsin’s grazing community. The program is modeled on formal apprenticeships that have long been used to train individuals in skilled trades such as plumbing and electrical. An apprentice must complete 4,000 hours of training, including 3,712 hours of paid work on the farm of a “master dairy grazier” who has been approved by DGA’s National Apprenticeship Committee composed of grass-based dairy farmers who have also been approved as masters. Potential masters are interviewed and assessed by DGA staff prior to approval. A minimum of five years of grazing dairy experience is required. Masters are expected to provide training and ensure that apprentices are competent in a specific set of tasks included in the DGA’s job book. These range from pasture management and supplemental feeding to milking systems and farm business management skills. Apprentices are paid a minimum of $8.00 per hour, with 50-cent increases every six months. Master farmers are not required to provide housing, but the value of any in-kind compensation such as housing, fuel, milk or cattle can be used to offset wages. Apprentices must be at least 18, have reliable transportation, and have the equivalent of a high school diploma. Over the course of two years, apprentices pay for the formal coursework portion of the 288 hours of related instruction, which costs about $1,200 for credit hours and books. Course topics include cattle nutrition, herd health, soil health and fertility, business and holistic management. Also required as part of this related instruction is attendance at events such as pasture walks and grazing conferences. Apprentices who successfully complete all of the requirements and train on the farm for at least two seasons graduate to “journey dairy grazier” status and receive an official Journey Card from the U.S. Department of Labor’s Employment and Training Administration. DGA offers financial consulting services to journey graziers as they seek business opportunities, which may include continuing to work at the same farm, moving to another operation as a skilled employee, manager or sharemilker, or gaining loan approval for their own farm start-up. Tomandl says that in addition to those hired from the DGA online application system, apprentices have included current employees and even family members of masters who saw the DGA’s structured program as an avenue for enhancing skills and improving engagement in the farm’s workings. He says that 11 apprentices have gained journey status since 2012. Of those, nine are farming, either on their own or with an established farmer. As of September 1, DGA counted 27 operating master/apprentice pairs, with 81 dairy graziers approved as masters and 88 people who had applied on the DGA website looking for apprentice opportunities. The program has started offering an internship option that can take place before entering into a full-fledged apprenticeship agreement. DGA staff and participants have found that communication is the key to a successful mentoring relationship. It starts with expectations, as some farmers have thought the program was simply providing a source of labor. Matching masters and apprentices is also a challenge, and DGA has been compared to a dating service in how it attempts to produce such pairings. Apprentices apply through the DGA website (https://www.dga-national.org/). Master graziers have access to the list, and can contact applicants through the site, by email or telephone. While the people who work for the DGA are willing to help in making contacts, in the end it is up to the two parties to figure things out on their own, says Mary C. Anderson, DGA education coordinator in western Wisconsin. Tomandl says DGA has learned that education coordinators such as Anderson are important in helping to resolve issues that may arise and in making sure that apprentices are advancing through the program. When interest is expressed in a state outside the current operating area, DGA seeks local partners who are willing to secure funding for at least one such person. For example, the University of Missouri and Cornell University in New York have been enlisted as partners in their states, and the Pennsylvania Association for Sustainable Agriculture (PASA) is backing DGA there. Eight education coordinators have been hired in the six DGA states. DGA has begun focusing on networking within its apprentice and master groups. For the apprentices that happens through educational events and social media, while masters may prefer phone conversations and occasional face-to-face meetings. The program has been successful in attracting funding, with several foundations providing dollars to match the core USDA grant that has been renewed twice since the first award. One of Tomandl’s prime missions is to convince agribusiness that the DGA is worth long-term investment. He says it will take time to show that industry will benefit from having a variety of dairy farms serving the rapidly evolving consumer market. 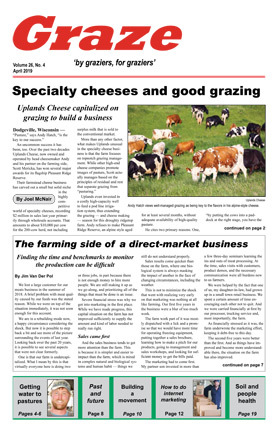 Tomandl says that he has emphasized DGA’s role in providing trained owners and managers for dairies that may not be large-scale confinement, but are still big enough to be commercial enterprises that need the products and services supplied by industry — products and services that may not be in demand from large-scale confinement operations. There has been some progress here. For instance, CROPP-Organic Valley has agreed to provide financial support for a limited number of its members participating in the DGA. Overall, though, enlisting industry support has been a slow go. Tomandl hopes that DGA is operating in more states within the next year or two. He encourages farmers from outside the program’s current areas to apply on the DGA website to become a master dairy grazier.